The fourth United Nations ‘international’ criminal court, the Special Tribunal for Lebanon, is due to open for business tomorrow. It has its headquarters in Leidschendam, which is near The Hague. Its subject-matter jurisdiction is confined to the assassination of Rafiq Hariri in 2005, and it will be applying the provisions of Lebanese law. The Tribunal has a website (http://www.un.org/apps/news/infocus/lebanon/tribunal/), but it has not been brought up to date in almost a year. There has as yet been no public announcement of the Tribunal’s personnel, but it is widely believed that the judiciary will include Prof. Antonio Cassese (see photo), who was first President of the International Criminal Tribunal for the former Yugoslavia, as well as another former judge of the Tribunal, Bert Swart, and a defense lawyer who practiced there, Howard Morrison. Four Lebanese nationals will also be named to sit as judges. The Prosecutor is a Canadian, Daniel Bellemare, according to the press briefing on the United Nations website yesterday (http://www.un.org/News/briefings/docs/2009/db090227.doc.htm). The Secretary-General is to make a statement tomorrow on the matter. Check out the International Law Observer (www.internationallawobserver.eu), which has many interesting and original comments on issues in public international law. In Prosecutor v. Milutinovic et al., five leading Serb officials in the Milosevic regime were convicted of crimes against humanity in relation to the ethnic cleansing of Kosovo in 1999 by the International Criminal Tribunal for the former Yugoslavia yesterday. 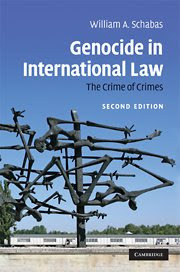 For the press release, judgment summary and the judgment itself, which runs to more than 2,000 pages: http://www.icty.org/sid/10070. Milutinovic himself, who was the president of Serbia at the time, was acquitted altogether. Congratulations to the defence counsel, Eugene O’Sullivan, who has been assisted throughout this case, may I add, by two brilliant graduates of the LLM programme at the Irish Centre for Human Rights. Also, the Special Court for Sierra Leone has issued its judgment in the three-defendant case involving the Revolutionary United Front. I couldn’t find the judgment on the website of the Court., but someone has sent me the official summary: http://www.mediafire.com/?inmhdn7toei. There is an intriguing reference to a dissent by Judge Pierre Boutet, but nothing in the summary to indicate what that might consist of. An article in yesterday’s New York Times (http://www.iht.com/articles/2009/02/25/america/25death.php) reports how US lawmakers are increasingly looking to the argument that capital punishment is a very costly means of law enforcement. One who is arguing for its abolition on this basis, according to the report, is Maryland Governor Martin O’Malley, to whom the National University of Ireland, Galway awarded an honorary doctorate last June. Because of the complex and often unending procedural issues involved in death penalty litigation, it is a very expensive process. The cost argument becomes more attractive in tough times. The article reports a death penalty supporter arguing that it is impossible to measure the social benefit of those who have been deterred from killing because of the death penalty. But this is a very weak argument, because of the poor evidence showing that capital punishment has a deterrent effect that is superior to that of long-term imprisonment. Maryland in fact provides a good example of this. Do you recall the famous 'belt-way snipers' from several years ago. This was a strange team of serial killers who murdered people at random in and around Washington. They were called the 'belt-way snipers' because the killings all took place within a few kilometers of the belt-way, which is the ring road around Washington. Now, Washington has no death penalty, whereas Maryland and Virginia do. Would you be surprised to learn that virtually all of the killilngs took place in Maryland and Virginia, and not Washington? If the death penalty is such a deterrent, why didn't these two mad serial killers simply drive a few kilometers in the other direction and put themselves outside the threat of execution? Belgium has filed proceedings against Senegal at the International Court of Justice charging a violation of international law by a failure to either try or extradite the former Chadian ruler, Hissan Habré, who has been living in Senegal for many years: http://www.icj-cij.org/docket/files/144/15052.pdf?PHPSESSID=fb2b1be847f114ca31179b66668fd5b6. Belgium wants to prosecute Habré for crimes against humanity and torture. Belgium also seeks provisional measures requiring Senegal to retain custody over Habré pending the proceedings. A fascinating new chapter in international human rights law and international criminal law has been opened by the Belgian application. It concerns application of the Convention Against Torture as well as the scope of customary international law. The Pre-Trial Chamber of the International Criminal Court has announced it will issue its decision on the application for an arrest warrant against President El Bashir of Sudan on 4 March 2009: http://www2.icc-cpi.int/NR/exeres/4B03F046-6792-40D7-B357-7D14CB723120.htm. By my count, that is 232 days after the arrest warrant application was filed. Issuance of an arrest warrant is governed by article 58 of the Rome Statute. The Pre-Trial Chamber must be 'satisfied' that there exist 'reasonable grounds to believe that the person has committed a crime within the jurisdiction of the Court'. Jeroen Temperman successfully defended his doctoral thesis yesterday. The title is: ‘State-Religion Relationships and Human Rights Law: Towards a Right to Religiously Neutral Governance’. Jeroen began studying a little more than two years ago, which in itself makes the accomplishment impressive. The thesis is a fascinating and thorough review of the relationship between States and religion, taken from a human rights perspective. the thesis was supervised by Prof. Joshua Castellino, formerly of the Irish Centre for Human Rights and now head of the law school at the University of Middlesex, in London. The external examiner was Dr Nazila Ghanea, of the University of Oxford. Jeroen leaves the Irish Centre for Human Rights this weekend to take up a position as lecturer at the University of Amsterdam. He is planning to live on a houseboat on a canal in the middle of Amsterdam. Since we began awarding PhD degrees, slightly more than four years ago, nineteen students have graduated. By my count, thirteen of them are working as university lecturers, with the others engaged in employment appropriate to their level of education. 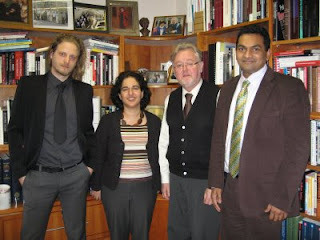 The photo shows, from left, Jeroen, Nazila Ghanea, myself and Joshua Castellino. Alison des Forges was on the plane that crashed in Buffalo last night. An historian by training, Alison had spent her life working on human rights issues in central Africa, and especially Rwanda. She was a frequent expert witness at the International Criminal Tribunal for Rwanda, and testified in many cases, including the Bagosora case (for which the judgment was issued a few days ago). Alison was awarded a Macarthur 'genius grant', and received many other honours. Her book, Leave None to Tell the Story, is the authoritative work on the Rwandan genocide. I first worked with Alison when we were members of a human rights fact-finding mission to Rwanda in January 1993. The report of the Commission that we belonged to, and of which Alison was the unofficial leader, warned of genocide in Rwanda some fifteen months before it began. She also led a mission to Burundi in January 1994, in which I participated. Her death is a terrible loss to all of us. I want to express my deepest condolences to her husband and family. The Rwanda Tribunal has finally issued the Trial Chamber judgment in the Military I (Bagosora et al.) case. It was posted on the Tribunal's website a few days ago: http://69.94.11.53/default.htm. This trial began in 2002, and involved individuals arrested in the mid-1990s. The proceedings themselves concluded in June 2007, and it took the Chamber another 20 months to issue its judgment. Do any readers of this blog know of a longer trial in the history of criminal justice? The judgment itself is 594 dense pages, which is probably close to a record too. There has been much chatter on the internet about this case, because when the Chamber announced the verdict in December 2008 the summary of the judgment said the Prosecutor had failed to prove that the accused was involved in a conspiracy to commit genocide. Many took this to imply that there was, in fact, no genocide. Moreover, the defence relied heavily on suggestions that there was an alternative explanation for the Rwandan genocide, and that blame for much of the killing could be placed on the Rwandese Patriotic Front. It also charged that the Prosecutor’s strategy, directed against perpetrators of genocide rather than against the RPF for alleged atrocities, was a source of unfairness. The Institute for War and Peace Reporting is looking for a reporter to cover the trial of Thomas Lubanga at the International Criminal Court, in the Hague, for the month of March only. There is a modest salary of 2500 euro. The person will have to write daily updates, Monday to Friday, to a tight afternoon deadline based on proceedings that day at the court. Stories are posted on www.lubangatrial.org, and in addition prepare a weekly summary and feature and analysis articles. The job ad says the candidate should be either willing to live in the Hague for one month or 'alternatively arrange access to a fast and reliable internet connection to monitor the trial live online'. Sounds like a great little job for a post-grad student in international criminal law. Candidates should send a cv and covering letter to Lisa Clifford, lisa@iwpr.net <mailto:lisa@iwpr.net> with "Hague Trial Reporter" in the subject line. But the Court issued a denial, saying no decision had been taken. So did the United Nations, http://www.icc-cpi.int/NR/exeres/A3275BE5-2D68-4962-9C11-90FAA646BF20.htm. The New York Times article is by Marlise Simons, who is very well informed and reliable, and I don’t think she made up the story. She does not refer to the sources, nor does she suggest this was officially announced by the Court, which it wasn’t. But that doesn’t mean she is wrong. Obviously she has been told that a decision has been taken by reliable sources, and I don't see any reason to doubt this. She says that the Court has already informed the United Nations Secretary-General. The warrant itself will almost certainly be issued within the next week or two. The only real issue in any doubt is whether it will include charges of genocide, as requested by the Prosecutor. The Prosecutor of the International Criminal Court was spotted some months ago at the Geneva Film Festival, in the company of the actress Hillary Swank. A photograph of the two of them appeared in a Finnish magazine. Someone should have warned the PR people at the Court about how effect Paxman can be! See also a recent story on this in the Los Angeles Times: http://www.latimes.com/news/nationworld/world/la-fg-court-palestinians5-2009feb05,0,6059347.story. The front page headline in today's Times declares: Prosecutor looks at ways to put Israeli officers on trial for Gaza 'war crimes' (http://www.timesonline.co.uk/tol/news/world/middle_east/article5636069.ece). It seems based on an interview by the Times reporter with Prosecutor Luis Moreno-Ocampo in Davos, where he is attending the World Economic Summit. When I was in The Hague a week ago, I picked up rumours along the same lines, namely, that the Office of the Prosecutor was examining the situation in Gaza to see if prosecutions might be possible. The International Criminal Court already has jurisdiction over crimes committed in Gaza by nationals of States parties to the Rome Statute. But who knows whether any possible suspects might qualify? 'Citizens' of Gaza and of Israel are certainly not covered in this way. But some might be dual nationals. The Court can get jurisdiction over the territory of Gaza in three ways: 1. Security Council referral (art. 13(b)); accession to the Rome Statute by the State to which Gaza belongs (art. 126); a declaration accepting jurisdiction over Gaza by the State to which Gaza belongs (art. 12(3)). You can see the problem. To which State does Gaza belong? Security Council referral would seem improbable. Palestine could make a declaration of accession. It would have to submit this to the Secretary-General of the United Nations, who is the depositary of the treaty. That would give the Court jurisdiction prospectively, assuming the Secretary-General accepted the accession. The Secretary-General would have to decide if Palestine was a State. But first, of course, Palestine would have to decide if it is a State. Palestine could also make a declaration under article 12(3). It is in a way the more interesting solution, because the determination as to whether Palestine is a State would be made not by the Secretary-General but, initially, by the Prosecutor and then by the Pre-Trial Chamber. Perhaps they would adopt an expansive approach to statehood so as to facilitate jurisdiction rather than stymie it. Finally, of course, Israel could ratify the Statute. That would give the Court jurisdiction over Israeli nationals. It wouldn't give the Court jurisdiction over Gaza. But it would probably give the Court jurisdiction over acts committed in Gaza that produced effects in Israel. The Prosecutor has been rather reticent about proceeding in situations that are not of 'sufficient gravity'. He has generally based his assessment on the number of victims. That is an additional issue to be addressed if this idea is to advance. The IWPR news service has some reports on the Lubanga trial, which opened at the International Criminal Court this week.